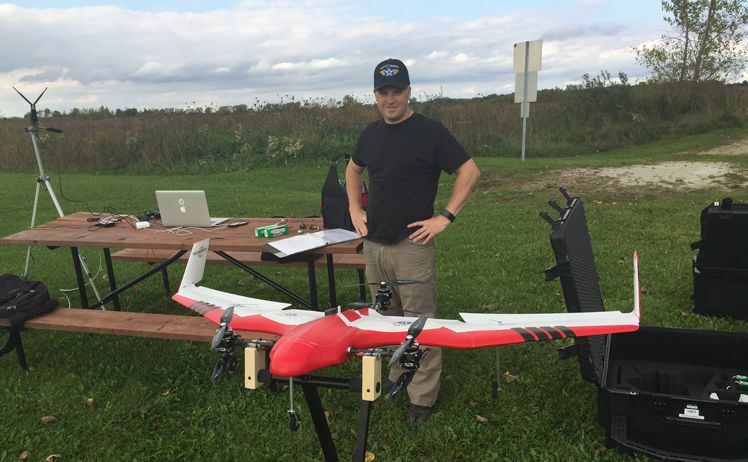 June 26, 2017 - As part of their ongoing public-private partnership with the UW Eau Claire Geography Department, Menet Aero has donated our 2016 BirdsEyeView Firefly6 Pro. "UAS technology is advancing at a pace that surpasses mobile phones" says Menet Aero CEO Peter Menet. The Firefly6 Pro is a revolutionary aircraft that is able to take off and land vertically like a helicopter but flies through the air like a airplane. This technology is known as Vertical Take Off and Landing (VTOL) and is being experimented with by companies like Google and Amazon. It is a perfect aircraft for small to medium size aerial mapping applications. It also has support for several types of payloads including large sensor RGB cameras, multi spectral sensors, and first person view (FPV) cameras. The intuitive custom user interface makes it a perfect general application platform for university research. Even though the FireFly6 Pro is less than a year old Menet Aero made the decision to retire it in order to standardize its fleet for scalability purposes. "Our fleet now consists of two more specialized aircraft to fill the role of this single, general application platform," says Menet. One of those new aircraft is a commercial-grade multi-rotor used for small confined surveys, film, tethered applications, and thermal inspections. The other is a military-grade fixed-wing capable of mapping thousands of acres or 20+ miles of corridors per day and carrying highly specialized sensors." "This is an investment in the UAS industry," says Menet. "The Menet Aero team is built on the foundation of military and commercial aviators committed to supporting the best organizations in the world with world class aviation support. UAS has made the data that used to reside solely in the realm of government research and large scale projects available to most companies at a reasonable price point. Having UWEC graduates in the workforce ensures there will be demand for Menet Aero's professional data acquisition services for many years to come." You can read more about this donation here.